Got a note from my brother-in-law and had to convey the idea. 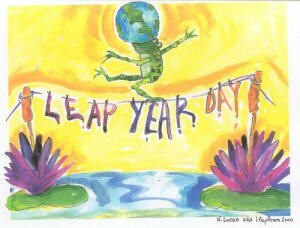 It has to do with “Leap Day” an aditional day added to bring balance to the calendar. His point was that we all need to incorporate the idea of a “Leap Day” concept in each of our lives. This is a great idea and a good wake up to those of us who have difficulty turning work off at the end of the day or on the weekend. We need balance in all of our relationships and connections. This entry was posted on February 29, 2008 at 2:27 am and is filed under Context, Cultural Ideas. You can subscribe via RSS 2.0 feed to this post's comments. You can comment below, or link to this permanent URL from your own site.